Regardless of the business you’re in, competition never gets easier. If you read the news, it doesn’t take long to notice just how many long-established businesses are closing their doors, or just barely hanging on. From big box retailers to local restaurants, no one is immune to competitive pressures. Despite all that, many small businesses continue to thrive. But how? There’s a number of critical success factors to take into account: value to your customers, consistency and engagement being three examples. 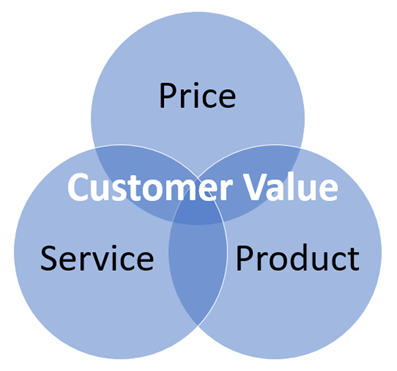 Customer Value – Customer value starts, obviously, with the customer. What the customer needs, how your business can deliver it, and how that delivery will be superior to other offerings at a price that makes sense. Product, service and price – all three integral to building relationships and increasing value in the minds of customers, both existing and potential. Some goods and services find their niche in being low-cost with no service and a sub-par product. Some are expensive with excellent service, but an average product. Finding the balance that works for you, your business, and your target market is key. Consistency – While the unique facets of your business and the goods/services you produce and provide is obviously a cornerstone of success, never underestimate the value of consistency. Don’t let your business be a “one-hit wonder,” and make sure that whatever you decide is differentiating your business maintains trust with your customers through consistency. Consistent results lead to consistent positive experiences, and positive experiences mean customers who will keep coming back and even recommend your business to others. Engagement and Extra Value – Engage with your customers, provide extra value through exceptional service and attention. A conversation can go a long way, and a discussion with your customers can help you understand what they really value. How can you adjust your business to better solve a problem or suit a customer’s needs? How can you set yourself apart from the competition? Can you deliver the value at that price point? Are there efficiencies you need to find to reduce your cost to deliver and stay profitable or do you need to change the offer? Think Through – Are you being asked for excessive discounts to win business? What is the long-term impact on your business if you do that? Never be afraid to walk away from a bad deal. We were asked to deliver a full-service catering for $3 a head for well over 1,000 people for the “marketing exposure.” We walked from that and believe a competitor jumped on that and not long after went under. Be smart – do a deal that makes sense for you and always make sure you have enough margin left to deliver on your promise. Long live small business! Gregory has been fortunate to have been part of building teams for companies that went through hyper-growth as well as his own company. He also has experience in working through economic downturns and taking responsibility to fix what is in his control. The focus has always been working with partners, customers, and building a successful business channel. His range of experience includes marketing, sales, support, training, and operations. Gregory holds an MBA from Nichols College.